Adelaide is an easy city to explore, with its broad, flat streets, beautiful Park Lands and a wealth of paths and dedicated bike lanes that make it very foot and bike-friendly. See all the tourist sites Adelaide and SA has to offer on a Brompton bike. Adelaide coffee is fast becoming world renowned, even getting recognition from the Melbourne gurus. No matter where you are in Adelaide, you’re within a few minutes of a top-notch cuppa… That is, if you know where to look. This leisurely ride around the CBD and through the parklands will take you to some of Adelaide’s most respected cafes and a few lesser-known venues. This tour is fully inclusive; so after you book, you wont need to think about a thing. With over 22,000 kilometres chalked up on our Caddy odometers, our riders know some of our City's most intricate and fascinating details. 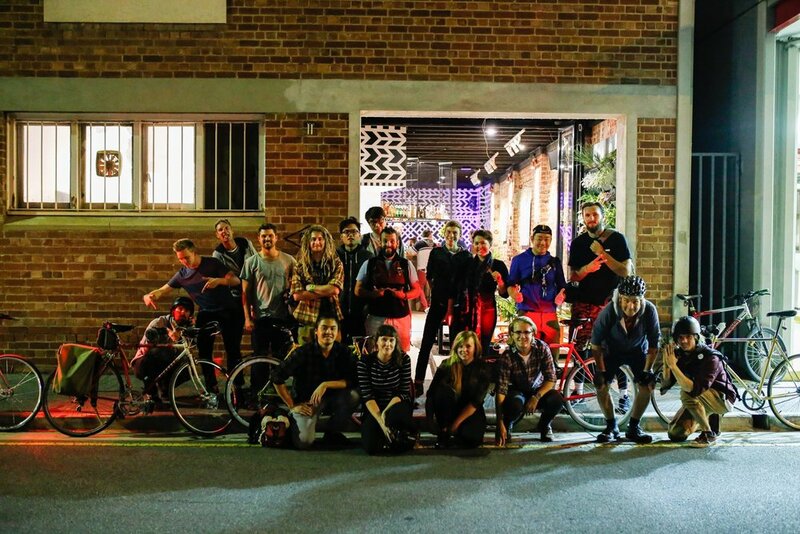 Experience them for yourself and join us for a short ride around the CBD, North Adelaide and nearby suburbs as we make our way through the streets and alleys, heading to a new venue each time. The distances aren't long and it'll be a fun pace the whole way, we won't lose you! Ride as far as you want to but know there's always a destination with drinks & food at the end. Each destination will be revealed on the day of the ride. More details on the EcoCaddy Night rides Facebook Group. The Parklands Trail is a fun, safe and easy route to experience Adelaide’s Park Lands. Make a day of it as exploring the Adelaide Park Lands Trail will take you through the historic West Terrace Cemetery, the stunning Himeji Gardens, and past the Botanic Gardens and National Wine Centre of Australia. It also passes the Adelaide Zoo, Old Adelaide Gaol and a number of BBQ and picnic areas. There are plenty of places around the city to park and lock up your bike. Some have been creatively made by South Australian artists as part of the Adelaide City Bike Art Trail. The large-scale sculptural works were commissioned by Adelaide City Council, with assistance from the South Australian Government through Arts SA. South Australia is home to award-winning wine, events and festivals. In fact, we've been named Australia's best festival state two years in a row. It's also the gateway to world-famous wine regions such as the Barossa and McLaren Vale, and Adelaide has been listed as one of the Great Wine Capitals of the World. There’s something very special about the Barossa. You can feel it in the landscape, in the people, the food and the wine. It’s a beautiful region, with villages, vineyards and farms dotting a patchwork vista. Barossans are famous for their generous hospitality, their love of a shared table and their passion for local food and wine. Festivals, celebrations, markets and music thrive here. Barossa is life’s great pleasures, in one unique place. Take your folded Brompton hire bike on the Adelaide - Gawler Train. Timetable available here. Only 45 minutes south of Adelaide in South Australia, McLaren Vale is home to sustainable winegrowing, world-class wines and culinary experiences, as well as pristine natural attractions and unparalleled tourism offerings. South Australia's viticultural origins began in McLaren Vale and our region's Mediterranean climate continues to drive our region's wine style and diverse food culture. Timetable available here for the Adelaide - Seaford Train line. In the Adelaide Hills cheese and chocolate, craft beer and cider, and even bread and jam are made the old-fashioned way - with hands and heart. You can satisfy your appetite in a country pub or bakery, take a gourmet approach in a sophisticated restaurant, or picnic with local produce fresh from the farm gate or roadside stall. Fresh seasonal local produce is the cornerstone of menus across the region. Access via public transport with folded bike is limited at this time. Please use private options.